The Agreement of Angora after the battle on the Sakaria signifies the satisfactory redemption of our relations with the West. This agreement was signed at Angora on the 20 th October, 1921. I will now give you a short account so that you may have an idea of the situation. You know that after the London Conference in which a special depu tation of ours, under the leaddership of Bekir Sami Bey had taken part, the Greek offensive had been repulsed ending in our second victory at Inongu. Then followed a lull in the military position for some time. We had concluded the Treaty of Moscow with Russia by which the po sition in the East had been made clearer. We thought it desirable to come to an understanding with the Entente countries who seemed to be inclined to respect our national principles. We attached special importance to the liberation of the districts of Adana and Aintab from foreign occupation. 524 . We noticed that the French, who occupied these Turkish pro vinces as well as Syria, were also inclined for various reasons to come to an understanding with us. Although the agreement made between Bekir Sami Bey and M. Briand an agreement that was found to be unacceptable by the National Government had been rejected, neither the French nor ourselves showed any desire to continue the hostilities. The attempt was made, therefore, on both sides to get into touch with one another. The French Government had at first unofficially sent M. Franklin Bouiluon, the former Minister, to Angora. For about two weeks I negotiated with him myself in the presence of Fewsi Pasha and Yussuf Kemal Bey, the Foreign Minister, after M. Franklin Bouillon had arrived at Angora on the 9 th June. After a private conversation for the purpose of making our mutual acquaintance, we had our first meeting in my quarters near the railway station at Angora on Monday, the 13 th June. After we had begun to exchange our views at this meeting the question before us was to define what should be the starting of our negotiations. I sug gested that on our side it should be the National Pact. M. Bouillon pointed out the difficulties that would arise from a discussion about this and suggested the Treaty of Sevres. Then he remarked, as though it were a foregone conclusion, that it would be advisable if we took the agreement that had been made in London between Bekir Sami Bey and M. Briand as the basis of our negotiations, reserving discussion on the points which were in contradiction to the Pact. To support this proposal, he asserted that our plenipotentiaries had not spoken about the National Pact in London, and, moreover, that nobody in Europe or even in Constantinople had yet sufficiently grasped the sense and real bearing of the Pact and the national movement. 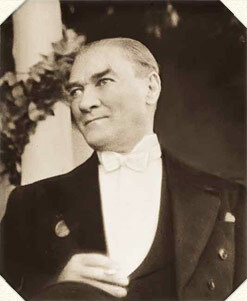 In my reply I remarked that a New Turkish State had arisen from the old Ottoman Empire, that it must be recognised, and that this New Turkey would, in any case, secure for herself the recognition of her rights in the same manner as the rights of any independent nation. “The Sevres Treaty,” I said, “is such a death sentence for the Turkish nation that we demand that its very name shall not be men tioned by anybody who calls himself our friend. Its name must not be referred to in the course of these negotiations. We cannot enter into confidential relations with countries that have not banished the Sevres Treaty from their minds. In our eyes this Treaty does not exist. If the leader of the Turkish Delegation which went to London has not spoken to this effect, it signifies that he has not acted in accordance with the instructions and within the compass of the full powers which were given him. He has made himself guilty of a mistake. We are well aware that this mistake has led to unfavourable impres sions in Europe and particularly in the public opinion of France. If we were to follow the same course as Bekir Sami Bey we would be committing a similar error. It is impossible that Europe is ignorant about our National Pact. It must have been brought to its knowledge. Europe and the whole world, however, witnessing how we have been shedding our blood for years, must surely have reflected on the causes of these sanguinary struggles. There is no truth in the assertion that Constantinople knows nothing about the Pact and the national struggles. The population of Constantinople together with the whole of the Turkish nation are fully informed and entirely approve of these struggles. In reply to my statement that Bekir Sami Bey had exceeded his instructions, M. Franklin Bouillon asked whether he might speak about this subject. I told him that he could do so to whomsoever he wished. Then he tried to make excuses so as not to be obliged to depart from the agreement made with Bekir Sami Bey and maintained that the latter had never spoken of the existence of the Pact nor that he had been instructed to keep within the limits of this Pact. After long negotiations, M. Franklin Bouillon finally proposed that the discussion should be adjourned so that he could read the Pact and grasp its meaning. Then the Articles of the Pact were read one after the other from the beginning to the end, and after that been done the negotiations were resumed. The Article that delayed us most was the one that referred to the abolition of the Capitulations and our complete independence. M. Franklin Bouillon remarked that these questions required more thorough study and deeper consideration. My explanations on this point may be condensed thus: “The attainment of our full and complete independence is the very essence of the mission we have taken upon ourselves. It is the duty we have undertaken before the nation and before history. It is certain that before undertaking this obligation we have thought a great deal about the prospects for its fulfilment. But in the end we are convinced that we shall succeed in our enterprise. We are people who have learned how to be practical and to face things in a proper manner. As a result of the faults committed by our predecessors, our nation, nominally independent, found itself in reality subject to numberless restrictions in its actions. “Everything invented hitherto with the object of depicting Turkey in the eyes of the civilised world as bristling with faults has its origin in this false impression and the consequences produced by it. To be governed by this error can only result in the country and the nation being deprived of their dignity and their vitality. We are a nation that wants to live, and desires to do so in full possession of our dignity and honour. We cannot be content to see ourselves deprived of these attributes, because we succumb to an error. All the individuals con stituting our nation, whether ignorant or educated, have without exception rallied around one principle, perhaps even without being conscious of the difficulties lying before them, and they have resolved to shed the last drop of their blood to carry out what they have to do in order to defend it. This principle is the attainment and mainten ance of our independence. Whoever speaks of complete and ^full independence means thereby unlimited independence: political, economic, legal, military, cultural, and the rest. If in any of these spheres of independence there should be something lacking, it would be equivalent to saying that the country has not yet gained its in dependence in the fullest meaning of the word. We do not believe that we can enjoy peace and rest until we have achieved this aim. We may conclude peace and enter into purely formal agreements; but our nation will never be at rest nor mistress of her own existence under a peace or an agreement which does not bestow complete in dependence on her. It could never happen that the nation would have given up the material struggle and consented to their destruc tion. But if they would have been inclined to be satisfied with such conditions as these why would they have gone on fighting for two years? M. Franklin Bouillon s observations in reply to my elucidations showed his seriousness and sincerity. In the end he expressed his conviction that after all it was only a question of time. For many a long day we carried on an exchange of views with M. Franklin Bouillon on a number of questions, some important and others of a minor character. I believe that at length we arrived at the stage of knowing one another as we really were in regard to our thoughts, sentiments and characters. But some time had to elapse before we could settle the points for a final understanding between the National Government and the French Government. What was to be expected? Perhaps, that the national existence ought to be confirmed by something still more impressive than the two battles at Inongu? The Agreement of Angora signed by M. Franklin Bouillon after he had obtained the final consent of his Government is a document which, as I have already pointed out, actually came into force on the 20 th October, 1921, thirty-seven days after the great battle on the Sakaria. Thanks to this agreement, valuable parts of our country were freed from occupation without the slightest measure of our independence in political, economic, military or any other regard being sacrificed. Through this agreement our national efforts were for the first time admitted and formulated by a Western Power.